Newport (Welsh: Casnewydd) is a city and unitary authority in south east Wales. It is located on the River Usk close to its confluence with the Severn estuary, 12 miles (19 km) east of Cardiff. It is the third largest city in Wales, with a population of 145,700 (2011 census). During the 20th century, the docks declined in importance, but Newport remained an important manufacturing and engineering centre. It was granted city status in 2002. It is the home of the University of Wales, Newport, and the Newport Gwent Dragons rugby union regional team, and hosted the Ryder Cup in 2010. Bronze Age fishermen settled around the fertile estuary of the River Usk and later the Celtic Silures built hillforts overlooking it. In AD 75, on the very edge of their empire, the Roman legions built a Roman fort at Caerleon to defend the river crossing. According to legend, in the late 5th century Saint Woolos church was founded by Saint Gwynllyw, the patron saint of Newport and King of Gwynllwg. The church was certainly in existence by the 9th century and today has become Newport Cathedral, the seat of the Bishop of Monmouth. The Normans arrived from around 1088–1093 to build Newport Castle and river crossing downstream and the first Norman Lord of Newport was Robert Fitzhamon. A third charter, establishing the right of the town to run its own market and commerce came from Humphrey Stafford, 1st Duke of Buckingham in 1426. By 1521 Newport was described as having "....a good haven coming into it, well occupied with small crays [merchant ships] where a very great ship may resort and have good harbour." Trade was thriving with the nearby ports of Bristol and Bridgwater and industries included leather tanning, soap making and starch making. The town's craftsmen included bakers, butchers, brewers, carpenters and blacksmiths. A further charter was granted by James I in 1623. During the English Civil War in 1648 Oliver Cromwell's troops camped overnight on Christchurch Hill overlooking the town before their attack on the castle the next day. A cannon-ball dug up from a garden in nearby Summerhill Avenue, dating from this time, now rests in Newport Museum. 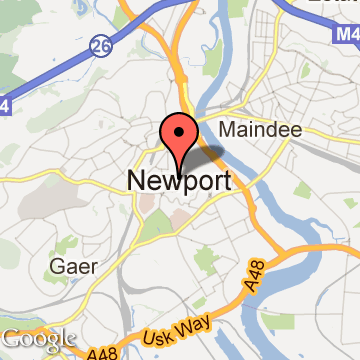 Newport Tourism - Get all information on Newport tourist places and sightseeing tours. Our website helps you plan your next tour and gives you great ideas on what to do, where to eat, where to stay and when to go there. We give the best information from the web to give you precise, meaningful and useful travel guide for leading places to visit in United Kingdom and from across the world. Our travel information on NEWPORT tourist places, tourist attractions, major sightseeing, the best time to visit, the top places to visit in Newport, the must-see things to see and do, maps, restaurants, hotels, nearby tourist destinations, local public information and more. To start with check out information on how to reach Newport.